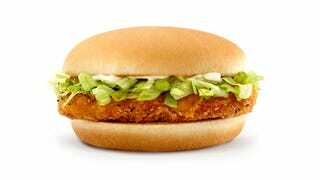 A Des Moines man is in jail today, after he assaulted his pregnant wife with a goddamn McChicken sandwich. And not by feeding it to her! By throwing it at her and smashing it into her face. That's way worse! The incident occurred yesterday afternoon, when the woman awoke her husband, Marvin Tramaine Hill II, apparently so that she could offer him a chicken sandwich. At which point he decided the thing to do was to attack his pregnant wife. With that very same sandwich. Because he did not like the sandwich. This feels like a good place to note that Marv is not, like, an infant, at least in terms of his biological age, which is 21 years old. The essential conundrum of the McChicken sandwich—and, more broadly, the entire McDonalds menu—is this: Pretty much no matter what you do with it, unless you are depositing it directly into the nearest garbage receptacle, somebody is being wronged. Usually, that person is whoever eats the damn thing. In this respect, I suppose Marvin Tramaine Hill II is something of an innovator. In another, more important sense, he is an abusive cretin. And in a third sense, he is a dumbass who is going to have a world-historically stupid answer when his cellmate asks him what he's in for. Don't assault people with chicken sandwiches. Thank you.